With support of a Planning Grant from the Andrew W. Mellon Foundation, the College of Humanities and Social Sciences (CHUSS) is undertaking study visits to research Centres on Teaching and Learning in universities in South Africa and the United States. The purpose of the visits is to benchmark best practices from these centres, which will inform the establishment of a similar Centre in the College and at Makerere University. 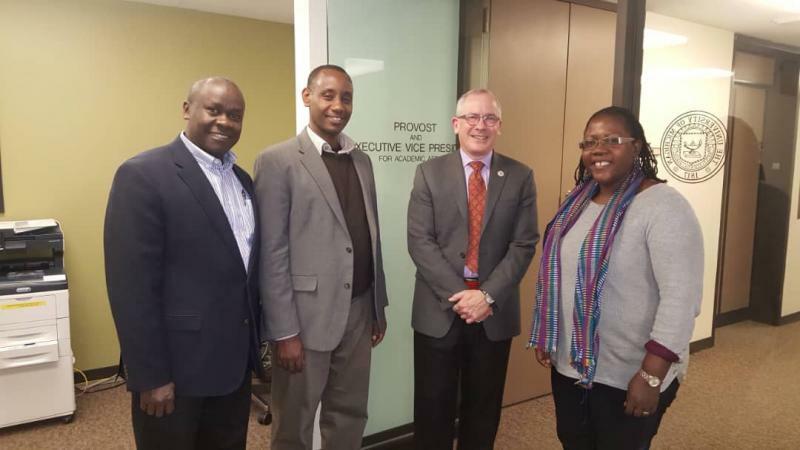 The Acting Principal of CHUSS, Associate Professor Josephine Ahikire, together with Associate Professor Andrew E. State (the Dean of the School of Social Sciences) and Associate Professor Aaron Mushengyezi (the Dean of the School of Languages, Literature and Communication), who are the Principal investigators on the project, visited the universities of Minnesota, Connecticut and Michigan in the United States to learn how these Centres support academic writing, teaching and learning activities in these universities. The team had fruitful discussions with various academic leaders in these universities on various areas of collaboration with Makerere University. The USA meetings followed an earlier visit to the universities of Cape Town and Rhodes led by the two Deans together with the Heads of Department of Linguistics, English Language Studies and Communication Skills (Dr Merit Kabugo) and Sociology and Anthropology (Professor Peter Atekyereza).